Champion has been around for a long time, founded nearly 100 years ago. Today, it is one of the largest athletic gear makers in the world, supplying all sports and having a global presence. 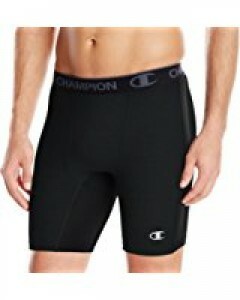 Champion’s compression shorts (found here) are not exactly high-end engineering, but the shorts can offer comfort and support to those with an active lifestyle. It’s likely that we have all been there, finishing up that last mile or last rep when the moisture becomes too much and your thighs begin to feel raw. That is where compression gear comes in, as it can help reduce the amount of lactic acid that your muscles retain by improving blood flow. Whether you are biking, running, or working out at the gym, compression shorts can cut down on irritating distractions such as rubbing, chafing, and excess moisture. Champion compression shorts are an excellent choice for improving comfort and performance. Functionality: Champion men’s compression shorts pass the test for functionality. By definition, compression means to apply pressure or hold together. By applying pressure to the buttocks and upper thighs, Champion’s compression shorts provide security and comfort while you exercise your active lifestyle. No more annoying rubbing or chafing. Also, being somewhat lighter than other brands on the market, these shorts allow for more flexibility. Another positive aspect of their lighter weight is that it makes them ideal for layering. Just put them on under your workout shorts or pants. They will not be in your way as they are made to hug your skin. These compression shorts do not bunch or bind, allowing you to focus on your work out, not on your under garments. They do a great job of keeping sweat away from the body. Champion’s shorts may help you improve your performance by ensuring that you stay cool and dry throughout your workout. Design: Champion men’s compression shorts are made of a blend of 84% polyester/16% spandex, making them breathable and moisture wicking while maintaining flexibility. The supportive front pouch ensures that everything stays in place, even throughout the most strenuous of workouts. The broad design in this area offers support without constriction. The superior materials hold their shape without losing their elasticity. Champion’s shorts have a 6” inseam, making them a perfect length to wear under athletic shorts or pants. The elastic waist, bearing the Champion logo, combine with flat seams ensure a close fit, while allowing ease of movement. These shorts are available in either black or slate grey heather, and they are machine washable. Champion offers these shorts in sizes Small thru 3XL. Using Champion’s size chart (see below), these shorts are true to size. However, if you are in doubt it would be best to order a size larger. Value: At an average price of $17, one third the price of competitors, Champion offers a great product at a reasonable price. Even after several uses and washings, the shorts hold their shape due to durable quality construction. Champion has been offering high performance apparel since 1919, and offers a satisfaction guarantee on all products. If you the customer are not completely satisfied with your purchase, you can return it anytime, for any reason, for a full refund. Now, that is a great way to stand behind a product. Also note that this product is made in America. While other brands such as Nike or Under Armor sale for an average of $40, Champion provides a comparable product at a great value. Overall: Champion compression shorts (here) are a low-budget way to add compression shorts to your athletic wear. Along with function, the shorts are also flattering. They can be worn alone or as a base layer. Champion provides an ideal product that even the economical athlete can access. Their “light” compression ensures you maximum movement and the protection you need for many types of workouts. Functionality, design, and value all come together to provide base layer shorts that support and protect the athlete during workouts. Given the price point, we would highly recommend this product for anyone seeking additional support and comfort. If you are in the market for compression shorts, the other pair of shorts at this price point that is definitely worth a look is the Nike Pro-Core. The Procore is a highly versatile compression short that is used in many different sports, and gets consistently strong reviews as well. You can go much higher-end, such as with the 2XU models, and if you are able to find those on sale for the same price as the Champions, we might suggest you go the 2XU route. For a good synopsis on what you get for the money in compression shorts, check out our article on the topic. It gives a thorough overview of the tradeoffs at each various price point.